§ 179-2 Site development application. § 179-5 Site plan details. § 179-6 Design standards and required site improvements. § 179-7 Schedule of fees. § 179-8 Site plan compliance; violation; revocation of permit. Recycling — See Ch. 188, Art. I. This chapter shall be known and may be cited as the "Site Plan Review Ordinance of the Borough of Alpine." Any change in tenancy of an existing nonresidential building or structure. Except as provided herein, no building permit shall be issued for a site development unless a site plan is first submitted and approved by the approving authority. No certificate of occupancy shall be given unless all construction and conditions conform to the site development plan as approved, unless conditionally approved by the approving authority as provided herein. Site development plan review not required. Single-family detached dwellings or for such accessory uses as a private garage, toolhouse, garden and private greenhouses, swimming pools and other similar uses incidental to a single detached dwelling or for similar improvements as accessory uses to a principal use. Ordinary or minor repairs to the exterior or interior of a building that do not involve structural changes or enlargements of the building, as defined in the Uniform Construction Code of the State of New Jersey. Renovations or alterations to the exterior or interior of any building or structure that do not involve any enlargement of the building or major structural change, as defined in the Uniform Construction Code of the State of New Jersey. Owners of property whose rights and obligations are determined by a settlement of litigation, order or judgment of a court, arising out of litigation, which includes issues relating to site development. However, the Construction Code Official shall refer any application for a building permit to the Planning Board for site plan approval, where the construction, reconstruction, alteration or change of use will affect circulation, water supply, sewage disposal, drainage, landscaping, signs, lighting, off-street parking or loading or the lack of any or all of these factors, environmental factors and other considerations as specified in this chapter. Does not effect existing parking facilities, vehicular or pedestrian circulation, drainage, relationship of buildings to each other, buffering, landscaping, sewage disposal, lighting, environmental factors and other considerations as specified in this chapter. If the Planning Subcommittee makes this determination to waive the procedural requirements for site plan approval, it shall, in writing, refer the applicant to the Construction Code Official for issuance of a change of use certificate which shall then be issued by the Construction Code Official. If this determination is made, the applicant shall have returned all but $50 of the application fee, or determine that the site development plan does require full site plan approval and refer the application to the Planning Board for site plan review, or determine that the site development plan conforms to the definition of minor site plan and refer the application to the Planning Board for minor site plan review. The Planning Board Subcommittee shall have 10 days from the receipt of an application to make a determination as provided by this section, Site development application. The provisions of this chapter shall be administered by the Planning Board in accordance with N.J.S.A. 40:55D-37, except that the Zoning Board of Adjustment shall substitute for the Planning Board whenever the Zoning Board of Adjustment has jurisdiction over a site plan as provided in Chapter 35, Land Use Procedures, § 35-10, of this Code. Where the Planning Board is referred to hereunder, this shall mean the Zoning Board of Adjustment, where such Zoning Board has jurisdiction. An owner or developer of land within the Borough shall, prior to developing a site as defined and covered in this chapter, submit to the Secretary of the Planning Board a preliminary site plan and such other information as is reasonably necessary to make an informed decision as to whether or not the requirements necessary for preliminary site plan approval have been met. The site plan and any engineering documents to be submitted shall be required in tentative form for discussion purposes for preliminary approval. If any architectural plans are required to be submitted for site plan approval, the preliminary plans and elevations shall be sufficient. If an application for development is found to be incomplete, the developer shall be notified in writing of the deficiencies therein by the Board or the Board's designee for the determination of completeness within 45 days of the submission of such application or it shall be deemed to be properly submitted. If the Planning Board requires any substantial amendment in the layout of improvements proposed by the developer that have been the subject of a hearing, an amended application for development shall be submitted and proceeded upon, as in the case of the original application for development. The Planning Board shall, following public hearing as specified in Chapter 35, Land Use Procedures, § 35-27, of this Code if the proposed development complies with this chapter and N.J.S.A. 40:55D-1 et seq., grant preliminary site plan approval. If the application for development is under the jurisdiction of the Zoning Board of Adjustment, the hearing, review, and approval procedures shall be included with and subject to the same requirements as for a zoning variance. Upon the submission of a complete application for a site plan which involves 10 acres of land or less, and 10 dwelling units or less, the Planning Board shall grant or deny preliminary approval within 45 days of the date of such submission, or within such further time as may be consented to by the developer. Upon the submission of a complete application for a site plan which involves more than 10 acres, or more than 10 dwelling units, the Planning Board shall grant or deny preliminary approval within 95 days of the date of such submission, or within such further time as may be consented to by the developer. Otherwise, the Planning Board shall be deemed to have granted preliminary approval of the site plan. Whenever review or approval of the application by the County Planning Board is required by N.J.S.A. 40:27-6.6, the Borough Planning Board shall condition any approval that it grants upon timely receipt of a favorable report on the application by the County Planning Board, or approval by its failure to report thereon within the required time period. Effect of preliminary site plan approval. Protection of applicant. Preliminary approval of a site plan shall protect the applicant, for a three-year period from the date of preliminary approval, from changes in the general terms and conditions on which preliminary approval was granted, including but not limited to use requirements; layout and design standards for streets, curbs and sidewalks; lot size, yard dimensions and off-tract improvements; and any requirements peculiar to such preliminary site plan approval. However, nothing herein shall be construed to prevent the Borough from modifying by ordinance such general terms and conditions of preliminary approval as relate to public health and safety. Submission for final approval. The applicant may submit for final approval on or before the expiration date of preliminary approval the whole or a section or sections of the preliminary site plan. Extensions on preliminary approval. The applicant may apply for and the Planning Board may grant extensions on such preliminary approval for additional periods of at least one year but not to exceed a total extension of two years, provided that, if the design standards have been revised by ordinance, such revised standards may govern. Submission of final site plan. The final site plan shall be submitted to the Secretary of the Planning Board within the time limit specified in Subsection B. If the plan and related information is not complete as specified in § 179-5, the applicant shall be notified within 45 days after the date of submission, or the application shall be deemed to be complete. The Planning Board shall act upon the final site plan within 45 days of the submission of a complete application. A public hearing shall not be required, except that if any substantial amendment in the layout of improvements proposed by the developer that have been the subject of a hearing is made or is required, the plan shall again go through the procedure required for preliminary site plans. Completion and inspection of improvements. The installation of improvements as required in § 179-6 and as included in the site plan, including principal and accessory buildings or other structures, shall not commence until after the approval of the final site plan and the submission of a certified location survey (including proposed elevations) to the Construction Official/Building Inspector. Such installation shall be subject to inspection by the Borough Engineer, and approval shall be revoked if there is significant deviation from the site plan as approved. Performance and maintenance bonds shall be released subject to approval by the Borough Engineer and Borough Council. All improvements shall be completed in a timely manner so as not to leave the site in an unfinished or unsightly condition, as determined by the Borough Council, and if this is not done, the final approval shall be deemed to be revoked, and the performance and maintenance bonds may be used by the Borough to restore the site to an acceptable condition. The issuance of building and occupancy permits shall be conditioned on the completion of improvements as specified in the final site plan application and submission and approval of an as-built certified survey. Site plan maps. Site plans shall be drawn on a map or maps to a scale not smaller than one inch equals 50 feet and not larger than one inch equals 10 feet. The name and address of the applicant and the owner and the name, address and title of the person preparing the plan, maps and accompanying data, the date of preparation, and the dates of each revision where applicable. An appropriate place for the signatures of the Chairman and Secretary of the Planning Board or Zoning Board of Adjustment, and the Borough Engineer. The lot and block number or numbers of the lot or lots from the Borough tax maps; length and bearings of the lot lines of the proposed project. The zone district in which the lot or lots are located and the zone district or districts of all the immediately adjoining lots. The location, size and nature of the entire lot or lots in question, and any contiguous lots owned by the applicant or in which the applicant has a direct or indirect interest even though only a portion of the entire property is involved in the site plan for which approval is sought; provided, however, that where it is physically impossible to show such entire lot or lots or contiguous lot or lots on one map, a key map thereof shall be submitted. The location, names and pavement and right-of-way widths of all existing and proposed streets abutting the lot or lots in question, the property lines of all abutting properties together with the names and addresses of the owners as disclosed on the Borough tax map and tax rolls as of the date of the site plan application, and the location of existing buildings within 200 feet of the site in question. The existing and proposed principal building or structure and all accessory building or structures, if any, with dimensions showing present and finished grade elevations at all corners and entrances of such building or structures, first floor elevations and the complete floor plans and elevation plans thereof. Present and proposed topography based on New Jersey Geodetic Control Survey Datum, at two-foot contour intervals. All existing and proposed setback dimensions, landscaped areas, trees over six-inch caliper on the part of the site affected by the proposed development, fencing and size and type of planting and plant material upon the subject lot or lots, including a planting plan drawn by a qualified landscape architect or landscape designer, and signed by him/her. The location, type and size of all existing and proposed curbs, sidewalks, driveways, street pavement widenings, fences, retaining walls, parking space areas and the layouts thereof and all off-street loading areas, together with the dimensions of all the foregoing, for the site and within 100 feet; number of employees, total and maximum on one shift. The location, type and size of existing and proposed catchbasins and storm drainage facilities and all utilities, both above and below ground. Drainage calculations shall be submitted to show the adequacy of proposed storm drainage facilities and security against flooding demonstrated, using a fifty-year design storm; evidence of approval by the State Department of Environmental Protection, where applicable, including encroachment permits. All existing and proposed signs and their size, nature of construction and location and all existing and proposed exterior lighting, including size, nature of construction, location, height, the area and direction of illumination and the lumen power. Soil erosion and sediment control plan as described in Chapter 195, Subdivision of Land, for sites where over 5,000 square feet of ground area is being disturbed. Cost estimates and proposed construction and maintenance bonds and construction time schedules related to building construction, for any required improvements under § 179-6 hereunder not proposed to be completed before the issuance of a certificate of occupancy. Plans for any off-tract improvements, including cost estimates and calculations of the share to be borne by the developer, under the standards described in Chapter 195, Subdivision of Land. For sites over five acres in size, an environmental impact statement, as specified in Chapter 195, Subdivision of Land. The size, shape, and materials of construction of the recycling area. Name and address of the collector of recycled materials. If recycled materials will be transferred to the Borough's recycling center or taken to some other location. All recycling areas shall be in a location on-site as approved by the Planning Board, and shall be adequately screened so that no recycled material is visible from the property line containing such area. All methods of storage, disposal and collection shall conform to any applicable requirements of Chapter 188, Solid Waste, Article I, Recycling. Any and all other information and data necessary to meet any of the requirements of this chapter not listed above. Compliance with zoning requirements; exceptions. Each site plan shall provide that the development be consistent with Chapter 220, Zoning, except in those cases where application is being made to the Zoning Board of Adjustment for a variance from the terms and provisions of Chapter 220, Zoning. Safe and efficient vehicular and pedestrian circulation, parking and loading, including widening of public roads and the provision of acceleration and deceleration lanes, where necessary. All public roadways, private roadways, and driveways serving more than two dwelling units shall comply with all otherwise applicable provisions of § 195-8B. Adequate screening and landscaping and appropriate location of structures. Exterior lighting for safety reasons, properly shaded so as to avoid glare on adjoining properties. Adequate water supply, drainage, sewage facilities and other utilities necessary for essential service to residents and occupants. Any area reserved for public use shall be of suitable size, shape and location to serve its intended purposes. No development shall take place in a delineated floodway area, and shall be permitted in a delineated flood fringe area only where it is determined by the Borough Engineer that the first-floor elevation will be above the flood level, and that construction and landfilling will not significantly increase flooding in other areas. Adequate protection and conservation of soils through an erosion and sedimentation control plan, where over 5,000 square feet of ground area is being disturbed. Standards for the grading, improvement and construction of streets or driveways and for walkways, curbs, gutters, streetlights, shade trees, screening, fire hydrants and water, drainage, sewage facilities and other improvements found necessary shall be as provided to the developer by the Borough Engineer, and such improvements shall be installed by the developer and, where related to public streets and drainage structures, shall be subject to performance guaranty requirements where not completed before issuance of a building permit and certificate of occupancy, and to maintenance guaranty requirements. A performance guaranty shall also be posted to restore the property to a sightly condition if the developer does not complete all the improvements in a reasonable time. Where certain utilities to be installed are under other governmental authority or jurisdiction, such shall be adhered to by the developer. A letter approving the proposed installations and a statement as to who will carry out the construction shall be required. Any off-tract water, sewer, drainage or street improvements required as a result of land development shall be paid for by the developer on a pro rata basis under the standards described in Chapter 195, Subdivision of Land. All taxes and assessments against the site shall be paid prior to any preliminary approval. Provisions for the collection, disposition and recycling of recyclable materials designated in Chapter 188, Solid Waste, Article I, Recycling, and in accordance with any applicable provisions of that chapter, in residential developments containing 25 or more multifamily housing units and in nonresidential developments utilizing 1,000 square feet or more of land area. A stormwater management system prepared by a design engineer in accordance with the provisions of N.J.A.C. 5:21-7, et seq. Policy statement. Flood control, groundwater recharge, and pollutant reduction through nonstructural or low-impact techniques shall be explored before relying on structural BMPs (best management practices). Structural BMPs should be integrated with nonstructural stormwater management strategies and proper maintenance plans. Nonstructural strategies include both environmentally sensitive site design and source controls that prevent pollutants from being placed on the site or from being exposed to stormwater. Source control plans should be developed based upon physical site conditions and the origin, nature, and the anticipated quantity or amount of potential pollutants. Multiple stormwater management BMPs may be necessary to achieve the established performance standards for water quality, quantity, and groundwater recharge. Purpose. It is the purpose of this section to establish minimum stormwater management requirements and controls for major development, as defined in Subsection B. This section shall also be applicable to all major developments undertaken by the Borough of Alpine. The adoption of this section shall not negate the requirements of Borough Ordinance No. 587, which requires that all developments within the Borough shall comply with the requirements of N.J.A.C. 5:21, even if the development is not classified as a major development. This requirement includes the development and/or redevelopment of single, standalone lots. Compatibility with other permit and ordinance requirements. Development approvals issued for subdivisions and site plans pursuant to this section are to be considered an integral part of development approvals under the subdivision and site plan review process and do not relieve the applicant of the responsibility to secure required permits or approvals for activities regulated by any other applicable code, rule, act, or ordinance. In their interpretation and application, the provisions of this section shall be held to be the minimum requirements for the promotion of the public health, safety, and general welfare. This section is not intended to interfere with, abrogate, or annul any other ordinances, rule or regulation, statute, or other provision of law except that, where any provision of this section imposes restrictions different from those imposed by any other ordinance, rule or regulation, or other provision of law, the more restrictive provisions or higher standards shall control. Definitions and word usage. Unless specifically defined below, words or phrases used in this section shall be interpreted so as to give them the meaning they have in common usage and to give this section its most reasonable application. The definitions below are the same as or based on the corresponding definitions in the Stormwater Management Rules at N.J.A.C. 7:8-1.2. An agency designated by the County Board of Chosen Freeholders to review municipal stormwater management plans and implementing ordinance(s). The county review agency may either be a county planning agency or a county water resource association created under N.J.S.A 58:16A-55.5, if the ordinance or resolution delegates authority to approve, conditionally approve, or disapprove municipal stormwater management plans and implementing ordinances. The division of a parcel of land into two or more parcels, the construction, reconstruction, conversion, structural alteration, relocation or enlargement of any building or structure, any mining excavation or landfill, and any use or change in the use of any building or other structure, or land or extension of use of land, by any person, for which permission is required under the Municipal Land Use Law, N.J.S.A. 40:55D-1 et seq. In the case of development of agricultural lands, "development" means: any activity that requires a state permit; any activity reviewed by the County Agricultural Board (CAB) and the State Agricultural Development Committee (SADC), and municipal review of any activity not exempted by the Right to Farm Act, N.J.S.A 4:1C-1 et seq. A geographic area within which stormwater, sediments, or dissolved materials drain to a particular receiving waterbody or to a particular point along a receiving waterbody. A neighborhood designated by the Urban Coordinating Council in consultation and conjunction with the New Jersey Redevelopment Authority pursuant to N.J.S.A 55:19-69. An area or feature which is of significant environmental value, including but not limited to: stream corridors; natural heritage priority sites; habitat of endangered or threatened species; large areas of contiguous open space or upland forest; steep slopes; and well head protection and groundwater recharge areas. Habitats of endangered or threatened species are identified using the Department's Landscape Project as approved by the Department's Endangered and Nongame Species Program. Any individual, corporation, company, partnership, firm, association, Borough of Alpine, or political subdivision of this state subject to municipal jurisdiction pursuant to the Municipal Land Use Law, N.J.S.A. 40:55D-1 et seq. The geographic application of the State Development and Redevelopment Plan's goals and state-wide policies, and the official map of these goals and policies. Water resulting from precipitation (including rain and snow) that runs off the land's surface, is transmitted to the subsurface, or is captured by separate storm sewers or other sewage or drainage facilities, or conveyed by snow-removal equipment. Stormwater management measures for major development shall be developed to meet the erosion control, groundwater recharge, stormwater runoff quantity, and stormwater runoff quality standards in Subsection D. To the maximum extent practicable, these standards shall be met by incorporating nonstructural stormwater management strategies into the design. If these strategies alone are not sufficient to meet these standards, structural stormwater management measures necessary to meet these standards shall be incorporated into the design. The standards in this section apply only to new major development and are intended to minimize the impact of stormwater runoff on water quality and water quantity in receiving water bodies and maintain groundwater recharge. The standards do not apply to new major development to the extent that alternative design and performance standards are applicable under a regional stormwater management plan or Water Quality Management Plan adopted in accordance with Department rules. Stormwater management requirements for major development. The development shall incorporate a maintenance plan for the stormwater management measures incorporated into the design of a major development in accordance with Subsection J. 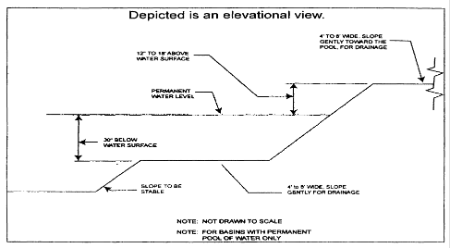 The applicant demonstrates that it does not own or have other rights to areas, including the potential to obtain through condemnation lands not falling under Subsection D(4)(c) above within the upstream drainage area of the receiving stream, that would provide additional opportunities to mitigate the requirements of Subsection D(6) and (7) that were not achievable on site. To the maximum extent practicable, the standards in Subsection D(6) and (7) shall be met by incorporating nonstructural stormwater management strategies set forth at Subsection D(5) into the design. The applicant shall identify the nonstructural measures incorporated into the design of the project. If the applicant contends that it is not feasible for engineering, environmental, or safety reasons to incorporate any nonstructural stormwater management measures identified in Subsection D(5)(b) below into the design of a particular project, the applicant shall identify the strategy considered and provide a basis for the contention. Site design features identified under Subsection D(5)(b)[b] above shall comply with the following standard to control passage of solid and floatable materials through storm drain inlets. For purposes of this subsection, "solid and floatable materials" means sediment, debris, trash, and other floating, suspended, or settleable solids. For exemptions to this standard see Subsection D(5)(c) below. A different grate, if each individual clear space in that grate has an area of no more than 7.0 square inches, or is no greater than 0.5 inches across the smallest dimension. Whenever design engineers use a curb-opening inlet, the clear space in that curb opening (or each individual clear space, if the curb opening has two or more clear spaces) shall have an area of no more than seven (7.0) square inches, or be no greater than 2.0 inches across the smallest dimension. Any land area used as a nonstructural stormwater management measure to meet the performance standards in Subsection D(6) and (7) shall be dedicated to a government agency, subjected to a conservation restriction filed with the appropriate County Clerk's office, or subject to an approved equivalent restriction that ensures that measure or an equivalent stormwater management measure approved by the reviewing agency is maintained in perpetuity. Guidance for nonstructural stormwater management strategies is available in the New Jersey Stormwater Best Management Practices Manual. The BMP Manual may be obtained from the address identified in Subsection G, or found on the Department's website at www.njstormwater.org. This groundwater recharge requirement does not apply to projects within the urban redevelopment area, or to projects subject to Subsection D(6)(a)[c] below. Industrial stormwater exposed to source material. "Source material" means any material(s) or machinery, located at an industrial facility that is directly or indirectly related to process, manufacturing or other industrial activities, which could be a source of pollutants in any industrial stormwater discharge to groundwater. Source materials include, but are not limited to, raw materials; intermediate products; final products; waste materials; byproducts; industrial machinery and fuels, and lubricants, solvents, and detergents that are related to process, manufacturing, or other industrial activities that are exposed to stormwater. The design engineer shall assess the hydraulic impact on the groundwater table and design the site so as to avoid adverse hydraulic impacts. Potential adverse hydraulic impacts include, but are not limited to, exacerbating a naturally or seasonally high-water table so as to cause surficial ponding, flooding of basements, or interference with the proper operation of subsurface sewage disposal systems and other subsurface structures in the vicinity or downgradient of the groundwater recharge area. In tidal flood hazard areas, stormwater runoff quantity analysis in accordance with Subsection D(6)(a)[a], [b], and [c] above shall only be applied if the increased volume of stormwater runoff could increase flood damages below the point of discharge. Any application for a new agricultural development that meets the definition of major development at Subsection B shall be submitted to the appropriate Soil Conservation District for review and approval in accordance with the requirements of this section and any applicable Soil Conservation District guidelines for stormwater runoff quantity and erosion control. For the purposes of this section, "agricultural development" means land uses normally associated with the production of food, fiber and livestock for sale. Such uses do not include the development of land for the processing or sale of food and the manufacturing of agriculturally related products. For purposes of TSS reduction calculations, Table 2 below presents the presumed removal rates for certain BMPs designed in accordance with the New Jersey Stormwater Best Management Practices Manual. The BMP Manual may be obtained from the address identified in Subsection G, or found on the Department's website at www.njstormwater.org. The BMP Manual and other sources of technical guidance are listed in Subsection G. TSS reduction shall be calculated based on the removal rates for the BMPs in Table 2 below. Alternative removal rates and methods of calculating removal rates may be used if the design engineer provides documentation demonstrating the capability of these alternative rates and methods to the review agency. A copy of any approved alternative rate or method of calculating the removal rate shall be provided to the Department at the following address: Division of Watershed Management, New Jersey Department of Environmental Protection, PO Box 418, Trenton, New Jersey, 08625-0418. If there is more than one on-site drainage area, the 80% TSS removal rate shall apply to each drainage area, unless the runoff from the subareas converge on site in which case the removal rate can be demonstrated through a calculation using a weighted average. Stormwater management measures shall also be designed to reduce, to the maximum extent feasible, the postconstruction nutrient load of the anticipated load from the developed site in stormwater runoff generated from the water quality design storm. In achieving reduction of nutrients to the maximum extent feasible, the design of the site shall include nonstructural strategies and structural measures that optimize nutrient removal while still achieving the performance standards in Subsection D(6) and (7). Additional information and examples are contained in the New Jersey Stormwater Best Management Practices Manual, which may be obtained from the address identified in Subsection G.
In accordance with the definition of "FW1" at N.J.A.C. 7:9B-1.4, stormwater management measures shall be designed to prevent any increase in stormwater runoff to waters classified as FW1. Encroachment within the designated special water resource protection area under Subsection D(7)(h)[a] shall only be allowed where previous development or disturbance has occurred (for example, active agricultural use, parking area or maintained lawn area). The encroachment shall only be allowed where applicant demonstrates that the functional value and overall condition of the special water resource protection area will be maintained to the maximum extent practicable. In no case shall the remaining special water resource protection area be reduced to less than 150 feet as measured perpendicular to the top of bank of the waterway or centerline of the waterway where the bank is undefined. All encroachments proposed under this subsection shall be subject to review and approval by the Department. A stream corridor protection plan may be developed by a regional stormwater management planning committee as an element of a regional stormwater management plan, or by a municipality through an adopted municipal stormwater management plan. If a stream corridor protection plan for a waterway subject to Subsection D(7)(h) has been approved by the Department of Environmental Protection, then the provisions of the plan shall be the applicable special water resource protection area requirements for that waterway. A stream corridor protection plan for a waterway subject to Subsection D(7)(h) shall maintain or enhance the current functional value and overall condition of the special water resource protection area as defined in Subsection D(7)(h)[a] above. In no case shall a stream corridor protection plan allow the reduction of the special water resource protection area to less than 150 feet as measured perpendicular to the waterway subject to this subsection. Subsection D(7)(h) does not apply to the construction of one individual single-family dwelling that is not part of a larger development on a lot receiving preliminary or final subdivision approval on or before February 2, 2004, provided that the construction begins on or before February 2, 2009. The following watercourses in the Borough of Alpine have been identified as Category One watercourses; Cresskill Brook, Demarest Brook, Anderson Brook, Dwars Kill Brook, and Sparkill Brook. Calculation of stormwater runoff and groundwater recharge. For the purpose of calculating runoff coefficients and groundwater recharge, there is a presumption that the preconstruction condition of a site or portion thereof is a wooded land use with good hydrologic condition. The term "runoff coefficient" applies to both the NRCS methodology at Subsection E(1)(a) and the Rational and Modified Rational Methods at Subsection E(1)(a). A runoff coefficient or a groundwater recharge land cover for an existing condition may be used on all or a portion of the site if the design engineer verifies that the hydrologic condition has existed on the site or portion of the site for at least five years without interruption prior to the time of application. If more than one land cover have existed on the site during the five years immediately prior to the time of application, the land cover with the lowest runoff potential shall be used for the computations. In addition, there is the presumption that the site is in good hydrologic condition (if the land use type is pasture, lawn, or park), with good cover (if the land use type is woods), or with good hydrologic condition and conservation treatment (if the land use type is cultivation). Groundwater recharge may be calculated in accordance with the following: The New Jersey Geological Survey Report GSR-32 A Method for Evaluating Ground-Water Recharge Areas in New Jersey, incorporated herein by reference as amended and supplemented. Information regarding the methodology is available from the New Jersey Stormwater Best Management Practices Manual; at http://www.state.nj.us/dep/njgs/; or at New Jersey Geological Survey, 29 Arctic Parkway, P.O. Box 427, Trenton, New Jersey 08625-0427; (609) 984-6587. Standards for structural stormwater management measures. Structural stormwater management measures shall be designed to minimize maintenance, facilitate maintenance and repairs, and ensure proper functioning. Trash racks shall be installed at the intake to the outlet structure as appropriate, and shall have parallel bars with one-inch spacing between the bars to the elevation of the water quality design storm. For elevations higher than the water quality design storm, the parallel bars at the outlet structure shall be spaced no greater than 1/3 the width of the diameter of the orifice or 1/3 the width of the weir, with a minimum spacing between bars of one-inch and a maximum spacing between bars of six inches. In addition, the design of trash racks must comply with the requirements of Subsection H(2). Stormwater management basins shall be designed to meet the minimum safety standards for stormwater management basins at Subsection H.
Stormwater management measure guidelines are available in the New Jersey Stormwater Best Management Practices Manual. Other stormwater management measures may be utilized provided the design engineer demonstrates that the proposed measure and its design will accomplish the required water quantity, groundwater recharge and water quality design and performance standards established by Subsection D of this section. Manufactured treatment devices may be used to meet the requirements of Subsection D of this section, provided the pollutant removal rates are verified by the New Jersey Corporation for Advanced Technology and certified by the Department. Technical guidance for stormwater management measures can be found in the documents listed at Subsection G(1)(a) and (b) below, which are available from Maps and Publications, New Jersey Department of Environmental Protection, 428 East State Street, P.O. Box 420, Trenton, New Jersey 08625; telephone (609) 777-1038. Safety standards for stormwater management basins. If a stormwater management basin has an outlet structure, escape provisions shall be incorporated in or on the structure. With the prior approval of the reviewing agency identified in Subsection H(3), a freestanding outlet structure may be exempted from this requirement. Safety ledges shall be constructed on the slopes of all new stormwater management basins having a permanent pool of water deeper than 2 1/2 feet. Such safety ledges shall be comprised of two steps. Each step shall be four to six feet in width. One step shall be located approximately 2 1/2 feet below the permanent water surface, and the second step shall be located one to 1 1/2 feet above the permanent water surface. 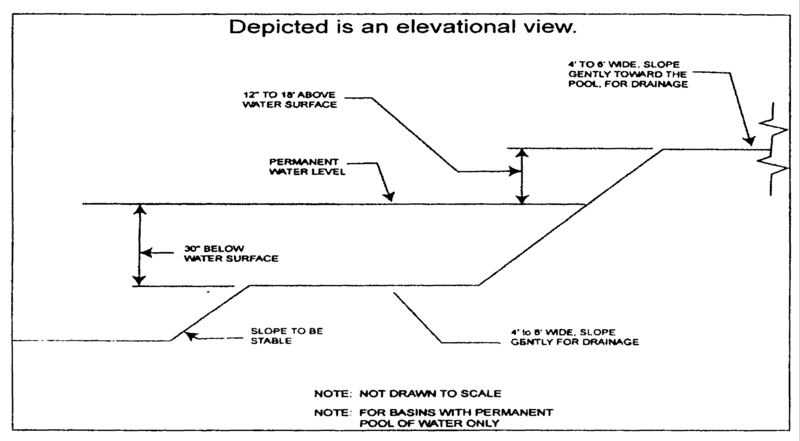 See Subsection H(4) for an illustration of safety ledges in a stormwater management basin. In new stormwater management basins, the maximum interior slope for an earthen dam, embankment, or berm shall not be steeper than 3 horizontal to 1 vertical. Requirements for a site development stormwater plan. Whenever an applicant seeks municipal approval of a development subject to this section, the applicant shall submit all of the required components of the Checklist for the Site Development Stormwater Plan at Subsection I(3) below as part of the submission of the applicant's application for subdivision or site plan approval. These requirements shall be in addition to the requirements specified under Borough Ordinance No. 583 ("Checklist Ordinance"). The applicant shall demonstrate that the project meets the standards set forth in this section. The applicant shall submit 16 copies of the materials listed in the checklist for site development stormwater plans in accordance with Subsection I(3) of this section. Site development stormwater plan approval. The applicant's site development project shall be reviewed as a part of the subdivision or site plan review process by the municipal board or official from which municipal approval is sought. That municipal board or official shall consult the engineer retained by the Planning and/or Zoning Board (as appropriate) to determine if all of the checklist requirements have been satisfied and to determine if the project meets the standards set forth in this section. Topographic base map. The reviewing engineer may require upstream tributary drainage system information as necessary. It is recommended that the topographic base map of the site be submitted which extends a minimum of 200 feet beyond the limits of the proposed development, at a scale of one inch equals 200 feet or greater, showing two-foot contour intervals. The map as appropriate may indicate the following: existing surface water drainage, shorelines, steep slopes, soils, erodible soils, perennial or intermittent streams that drain into or upstream of the Category One waters, wetlands and floodplains along with their appropriate buffer strips, marshlands and other wetlands, pervious or vegetative surfaces, existing man-made structures, roads, bearing and distances of property lines, and significant natural and manmade features not otherwise shown. Project description and site plan(s). A map (or maps) at the scale of the topographical base map indicating the location of existing and proposed buildings, roads, parking areas, utilities, structural facilities for stormwater management and sediment control, and other permanent structures. The map(s) shall also clearly show areas where alterations occur in the natural terrain and cover, including lawns and other landscaping, and seasonal high ground water elevations. A written description of the site plan and justification of proposed changes in natural conditions may also be provided. Land use planning and source control plan. This plan shall provide a demonstration of how the goals and standards of Subsection C through F are being met. The focus of this plan shall be to describe how the site is being developed to meet the objective of controlling potential groundwater recharge, stormwater quality and stormwater quantity problems at the source by land management and source controls whenever possible. Comprehensive hydrologic and hydraulic design calculations for the pre-development and post-development conditions for the design storms specified in Subsection D of this section. Maintenance and repair plan. The design and planning of the stormwater management facility shall meet the maintenance requirements of Subsection J.
Waiver from submission requirements. The municipal official or board reviewing an application under this section may, in consultation with the Municipal Engineer, waive submission of any of the requirements in Subsection I(3)(a) through (f) of this section when it can be demonstrated that the information requested is impossible to obtain or it would create a hardship on the applicant to obtain and its absence will not materially affect the review process. Applicability. Projects subject to review as in Subsection A(3) of this section shall comply with the requirements of Subsection J(2) and (3). If the person responsible for maintenance identified under Subsection J(2)(b) above is not a public agency, the maintenance plan and any future revisions based on Subsection J(2)(g) below shall be recorded upon the deed of record for each property on which the maintenance described in the maintenance plan must be undertaken. The person responsible for maintenance identified under Subsection J(2)(b) above shall maintain a detailed log of all preventative and corrective maintenance for the structural stormwater management measures incorporated into the design of the development, including a record of all inspections and copies of all maintenance-related work orders. The person responsible for maintenance identified under Subsection J(2)(b) above shall evaluate the effectiveness of the maintenance plan at least once per year and adjust the plan and the deed as needed. The person responsible for maintenance identified under Subsection J(2)(b) above shall retain and make available, upon request by any public entity with administrative, health, environmental, or safety authority over the site, the maintenance plan and the documentation required by Subsection J(2)(f) and (g) above. The requirements of Subsections J(2)(c) and (d) do not apply to stormwater management facilities that are dedicated to and accepted by the municipality or another governmental agency. Violations and penalties. Any person who erects, constructs, alters, repairs, converts, maintains, or uses any building, structure or land in violation of this section shall be subject to up to the maximum penalty prescribed by law. When effective. This section shall take effect immediately upon the approval by the county review agency, or 60 days from the receipt of the ordinance by the county review agency if the county review agency should fail to act. Preliminary site plan: $1,000 for each acre or part thereof involved in the site to be developed, plus $2.50 for each 200 square feet of building floor area or part thereof. Final site plans: same amounts. Any unused portion of the deposit shall be returned to the applicant. If the cost of review services exceeds the amount of deposit, sufficient additional funds shall be deposited before any approved site plan is returned to the applicant. The inspection fee deposit for the installation of improvements shall be 2% of the improvement costs as estimated by the Borough Engineer. Failure to comply with any of the conditions of site plan approval subsequent to the receipt of a building permit or certificate of occupancy, as the case may be, shall be construed to be a violation of this chapter and shall be grounds for revocation of any building permit or certificate of occupancy, as the case may be. Written notice of revocation sent by certified mail by the Building Inspector, requiring compliance with the conditions of site plan approval within a period of time of not less than five days, shall effectively revoke any building permit or certificate of occupancy, as the case may be, if compliance shall not be made within the time limit set.